The interest in Big Data (nice post by a collegue on this subject) has sparked a new interest in Semantic Technologies. It is clear that the Volume and Variance of Big Data requires technologies that can structure and segment Big Data into useful and usable structures. For this, Semantic Technologies are used. However there are different kinds of Semantic Technologies around, so I will start off with an introduction on Semantics and the Semantic Web. Next I will cover two key Semantic Technologies to arrive at the goal of this introduction: How do Semantic Technologies help us to crunch Big Data. "Content that is meaningful to computers"
Tim Berners-Lee understood that HTML web pages were useful to humans, but since they were (and often still are) encoded to store visual information, rather than the meaning of the information, they were of no use to automated systems to understand. The computer can now apply a formatting style on all authors, and can index them separately, but still cannot use the meaning of the concept “Author” or distinguish this Tim Berners-Lee from any other Tim Berners-Lee (If you think this is a silly example, please visit the Michael Jackson disambiguation page on Wikipedia: http://en.wikipedia.org/wiki/Michael_Jackson_(disambiguation)). "Using Semantic Technologies, meanings is stored separately from data and content files, and separately from application code"
So in our example, the author role is matched to a central definition for the creation of documents, preferably using a standard such as the Dublin Core standard “DC.creator”. In the next step we can replace “The Semantic Web” and “Tim Berners-Lee” with Unique Resource Identifiers (URI). For ease of understanding, the URI for Tim Berners-Lee could be: http://en.wikipedia.org/wiki/Tim_Berners-Lee and the article could be referenced as: http://dx.doi.org/10.1038/scientificamerican0501-34. So from a formatted piece of text we arrive at a well-defined relation between two specific URI’s. A computer now can apply logic, based on understandable definitions and relationships. Such a relationship is called a “Triple”: consisting of three pieces of information – from left to right: a Subject, a Predicate and an Object – together describing a piece of knowledge. The de facto standard for expressing Semantic information is the W3C's Resource Description Framework (RDF). 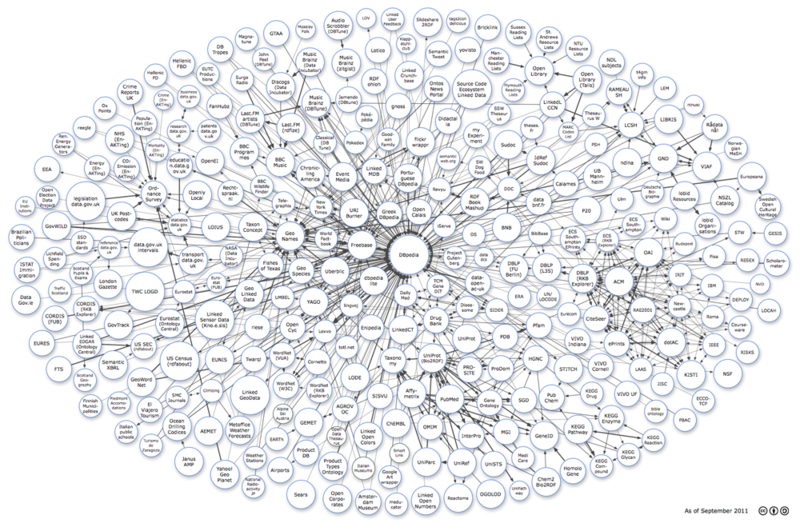 So what do we need to make the Semantic Web work? Vocabularies: the concepts and relationships between them that describe a certain domain. From the given example, it is easy to understand that a vocabulary + dataset can expand into millions or billions of triples. Performance – both ingestion and querying – are important considerations. Some of the better known Triple Stores are Sesame and Jena for smaller implementations and OWLIM, MarkLogic and Virtuoso for large implementations. To use the Big, we have to understand the Data. In an ideal world, data is created according to a well organised ontology. Alas, in most cases Big Data is created with no ontology present. To create structure from unstructured data (or structured with a different goal in mind) we need automatic recognition of meaning from our data. This usually starts with recognising types of information using Semantic Enrichment Technologies. Semantic Enrichment Technologies are a collection of linguistic tools and -techniques such as Natural Language Processing (NLP) and artificial intelligence (AI) to analyse unstructured natural language or -data and try to classify and relate it. By identifying the parts of speech (subject, predicate, etc. ), algorithms can recognise categories, concepts (people, places, organisations, events, etc. ), and topics. Once analysed, text can be further enriched with vocabularies, dictionaries, taxonomies, and ontologies (so regardless which literal is used, concepts are matched, for example: KLM = Koninklijke Luchtvaart Maatschappij = Royal Dutch Airlines). This layer of linked metadata over our data creates Linked Data. The quality of enrichment will range from (nearly) 100% for literal translated content to 90% or less, depending on the amount of training that is available. So Semantic Enrichment Technologies gives us the opportunity to turn Big Data into Linked Big Data. Governments and other public organisations are putting much effort in providing Linked Open Data for citizens and organisations to use. Commercial organisations will not likely openly publish their data, but will use the same standards as Linked Open Data (such as HTTP, URIs and RDF) and therefore have similar implementations for Linked Big Data. I will post more on Triple Stores and Semantic Enrichments in future blogs.